The 6C Series is the successor to the Powermondial range. 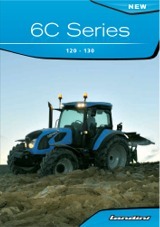 The Landini 6C Series is the successor to the Powermondial range. It comprises two models powered by the new FPT NEF 4.5L engines delivering 121 and 133hp respectively with the Dual Power system. Techno and Top models are available in this series. The 6C Top model features a 3-stage powershift transmission with 36+12 speeds and a 5000kg rear lift capacity. The 6C tractor can be optionally equipped with a front axle and cab suspension to enhance ride comfort during transport. A load sensing hydraulic system is available that increases hydraulic performance in applications such as loader work or demanding hydraulically driven machinery. The cab offers more comfort including a new passenger seat.